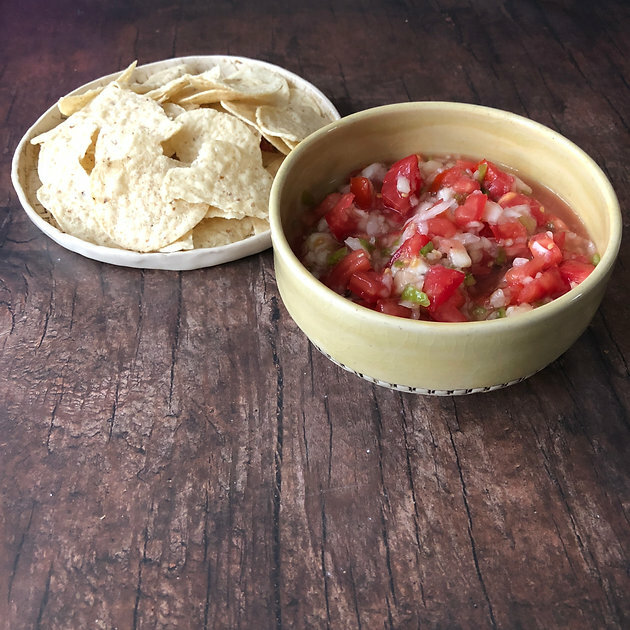 One of the things I love about salsa is how incredibly simple it is to make, while still being delicious and fairly impressive, especially if you use even slightly unconventional ingredients. 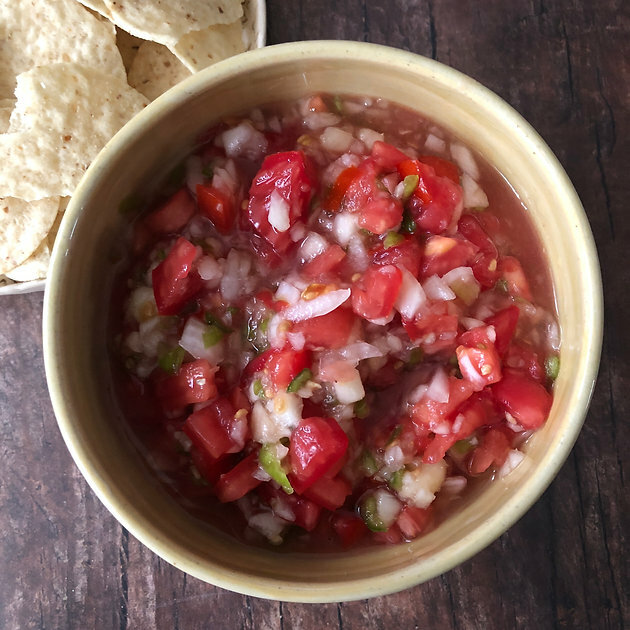 I make some version of salsa all summer long for BBQ’s and picnics, it’s always a hit, and really all it takes is chopping up the ingredients and mixing them together. Choosing the specific ingredients you use is an easy way to adapt salsa to suit your tastes, and use what you happen to have on hand. 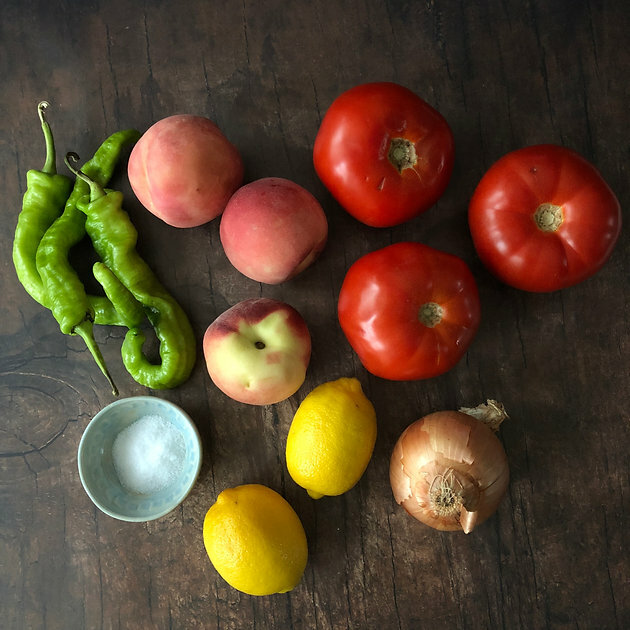 My summer salsa recipes almost always have tomatoes, onion, and spicy peppers (and you can always just stop there) and then I add in whatever other fruit or vegetables I have, or that happens to be in season. Peach though is probably my favorite, and I had been waiting impatiently for local peaches to be available, and finally picked some up at a roadside farmstand last weekend in New Jersey on my way to the shore. I also got Italian long hot peppers instead of the classic jalapeno, since I currently have 6 jalapeno plants growing on my back deck, and anticipate a lot of jalapeno salsas in my near future. Choosing different types of peppers is also great for controlling the heat of your salsa if you like things more or less spicy. I use a food processor for everything except the tomatoes, which I chop by hand. I also chop the tomatoes first, let them sit for a few minutes, and then drain any juice off, so the salsa doesn’t get too watery. Be careful when chopping hot peppers, it’s probably best to wear gloves. The white pith inside, and the seeds hold most of the heat, so you can include or exclude them to suit your tastes. The Italian long hot peppers I used were mild, so I didn’t bother to remove the pith or seeds. Once everything is chopped, mix it together and add salt and lemon juice to taste (remember the chips you eat the salsa with will likely be salty, so don’t over do it). I didn’t have any one hand, but cilantro is also a great addition to salsa!